Most people do not pay too much attention on the rain gutters. In fact, the only time they take notice about them is when something goes wrong. Gutters and downspouts are responsible for collecting and carrying away rain water. By carrying off rain water, they prevent it from running off the roof and splashing down. When rainwater splashes down, it damages the home sidings and erodes the soil. Most notably, downspouts and gutters offer a first line of defense for the basement, which is susceptible to rainwater. 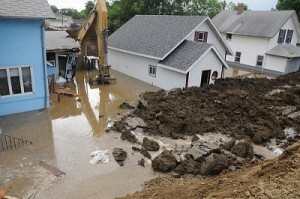 Rainwater should not be allowed to collect along the foundation of your house. This is because it leads to a buildup of hydrostatic pressure. At length, water will find its way into your home and wreak havoc. It is equally important to ensure that the ground surrounding a hillside house stays dry. That is why you need to ensure that gutters are working properly. Gutters can get damaged over time. When they are not functioning properly, you should repair them as soon as possible. When there is a heavy storm, you will not worry about rainwater collecting along the foundation of your house. Your gutters can develop holes in a number of ways. First, rust can eat through steel gutters and create holes. Aluminum and copper gutters can easily get punctured when sharp tools or branches fall on them. You can also find a hole drilled on the gutter to drain away standing water. The major reason why a gutter may fail to drain properly is its sloping position. If it is not sloping toward the downspout, water may collect on it. This problem can also occur if the gutters are sagging and need to be lifted up. Holes should be patched immediately to keep them from growing bigger. All you need is a roofing cement and metal repair patch. The patch you acquire should match the gutter material. For instance, aluminum flashing should be used on aluminum gutter. To patch holes in gutters, clean the affected area, get rid of any rust and apply the flashing. The joints between the lengths of gutters become dysfunctional over time. Worse yet, seamless gutters are also affected by drips. This is because they contain seams where the gutters are actually connected to downspout outlets and preformed corners. Therefore, you should fixe all leaking joints whether straight joint or corner joints. Gutters are usually held in place by large spikes. When any spike pulls off, the gutter sags. In some cases, it may come crashing down depending on the number of spikes that may have pulled off. The only way to fix this problem is replacing the spike with something that will not pull off easily. You can consider a stellar material for your eavestrough in Oakville when you shop around. All in all, these are some of the problems that you can handle when dealing with damaged gutters. For extensive damages, it is highly recommendable to hire a professional gutter repair specialist. This is because they have the expertise needed for quality work, and they have the right equipment to tackle complex cases.